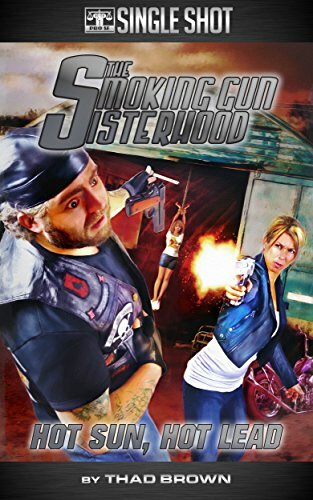 A leading Publisher of Genre Fiction, Pro Se Productions announces the debut of a Pro Se Single Shot that blazes with both barrels as a follow up to Author Thad Brown’s The Smoking Gun Sisterhood, released earlier this year. Hot Sun, Hot Lead is a tale of mobsters and hard-boiled detectives. Author Thad Brown introduces a new name to the growing roster of female shamuses in Pro Se Productions’ gamut of sleuths: Becca Grant. After months of trailing drug kingpin Carlos “El Diablo” Gonzalez, P.I. Becca Grant’s informant may finally have provided her with a shot at taking the cartel leader down, but with the boys in blue on strike, she has no one to back her up. Unwilling to let Gonzalez slip away again, Becca enlists the help of her tenacious yet inexperienced secretary, Tressa. Armed with only a couple 9mms and a .45, the two women set off to face Gonzalez and his goons on their own and put an end to his drug trafficking career.